"WHERE'D YOU GET THAT SHIRT?" We'll create custom rhinestone apparel JUST FOR YOU! Celebrate your special occasion, team, fundraiser, brand, business or passion. 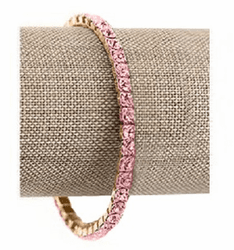 Pretty in pink in light rose crystals on your choice of gold plating or silver (rhodium) this Swarovski bracelet is sparkling and beautiful on its own, or stacked with all of your favorite bangles & baubles. As a Swarovski Elements Preferred Branding Partner, We are proud to offer the original, genuine Swarovski stretch crystal bracelets! 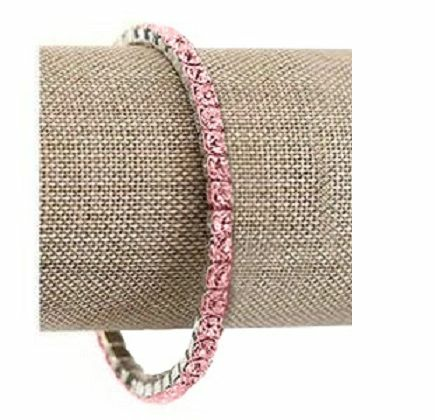 These have 4mm ROUND size stones and are AUTHENTIC Swarovski. Often mistaken for diamonds, these make such a pretty treat for you, or a friend.